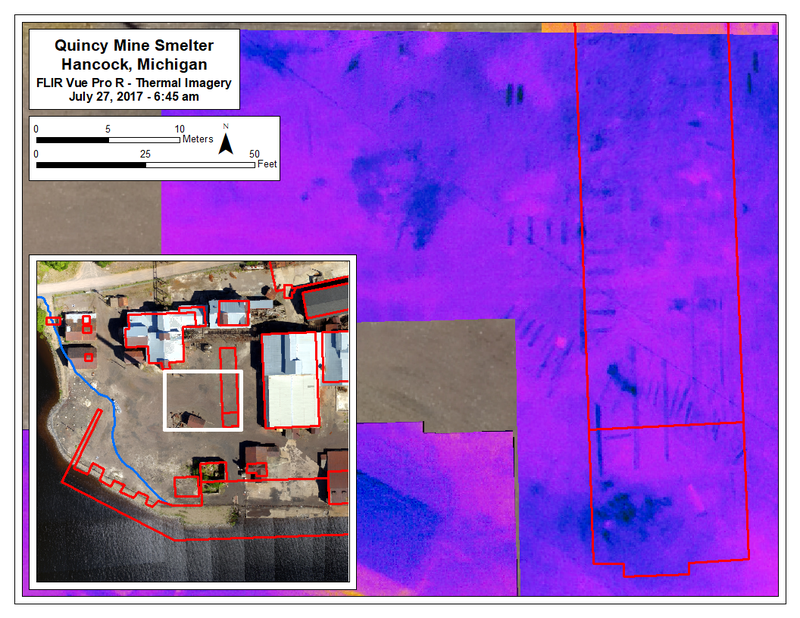 After years of talking about our potential to collaborate on remote sensing and geospatial mapping technologies, I finally had an opportunity to work with some colleagues at the Michigan Tech Research Institute (MTRI). We decided to scrape together some resources so we could experiment. Rick Dobson, Research Scientist, and David Banach, Assistant Research Scientist, were both going to be in Houghton in July for some other important meetings. 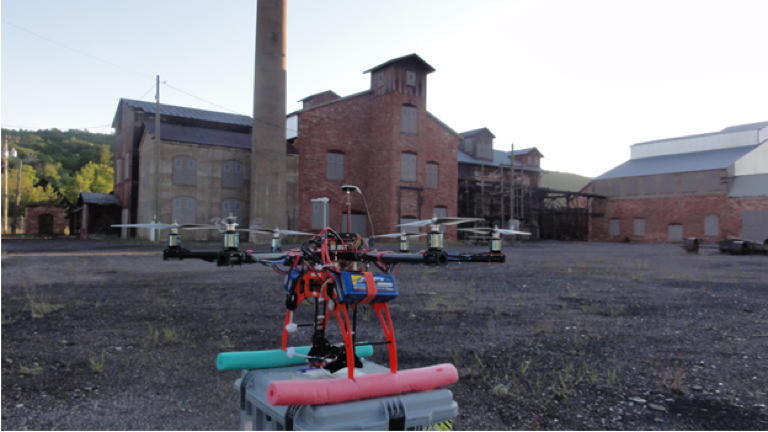 We convinced their boss to extend their visit so that we could get a few days to fly UAVs over industrial heritage sites in the Copper Country. 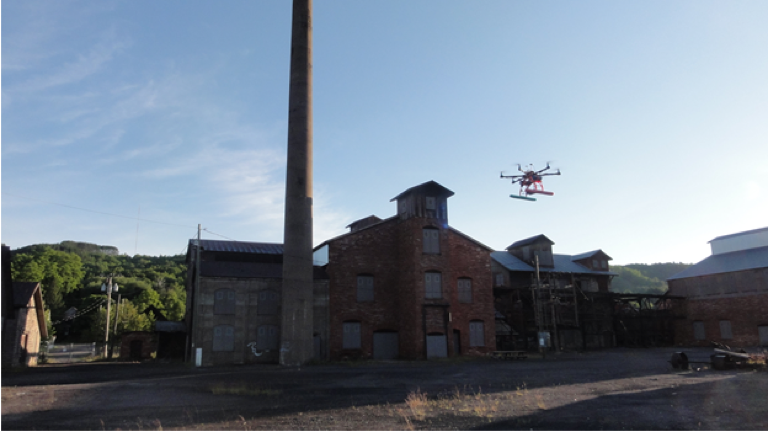 Figure 1: The Bergen Hexacopter and FLIR camera flying at the Quincy Smelter. 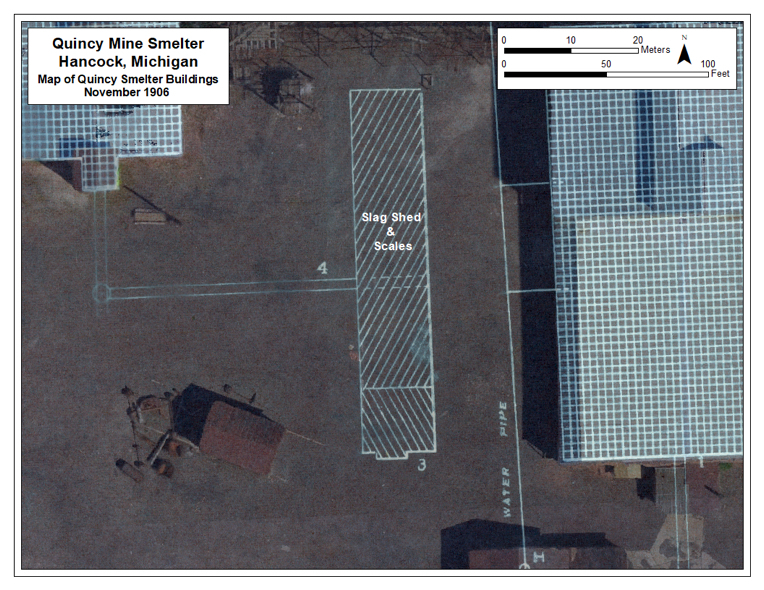 Figure 2: GIS overlay of 1906 plan map superimposed over a geo-referenced aerial image, showing the location of the Slag Shed and Scales building, and some underground water pipe locations. These were some of the targets we were investigating. Reports and publications from this work will be submitted to the Keweenaw National Historical Park Advisory Commission so the information can be used to guide future management decisions and in the development of interpretive programming. Copies will also be archived at Michigan Tech's University Archives and Historical Collections, and if given permission, we will make them free to download from the Department of Social Sciences website. Figure 3. Geo-referenced high-resolution photogrammetric DEM with the 1906 Slag Shed and Scales outlined in red. 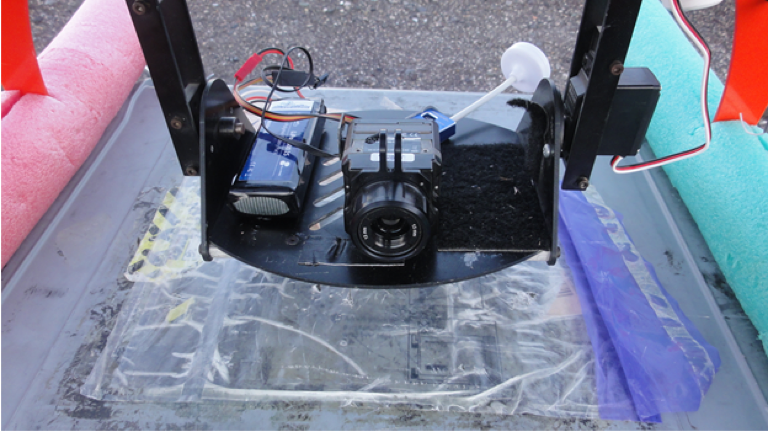 Figure 4: FLIR Vue Pro R thermal camera onboard of the Bergen Hexacopter. 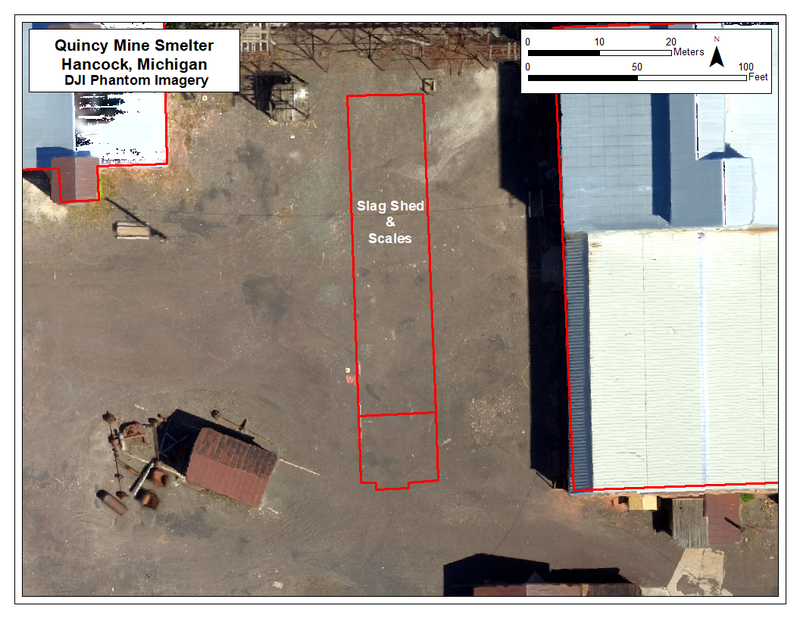 Figure 6: Geo-referenced FLIR Vue Pro R thermal imagery overlain on the photogrammetric DEM with the 1906 Slag Shed and Scales outlined. 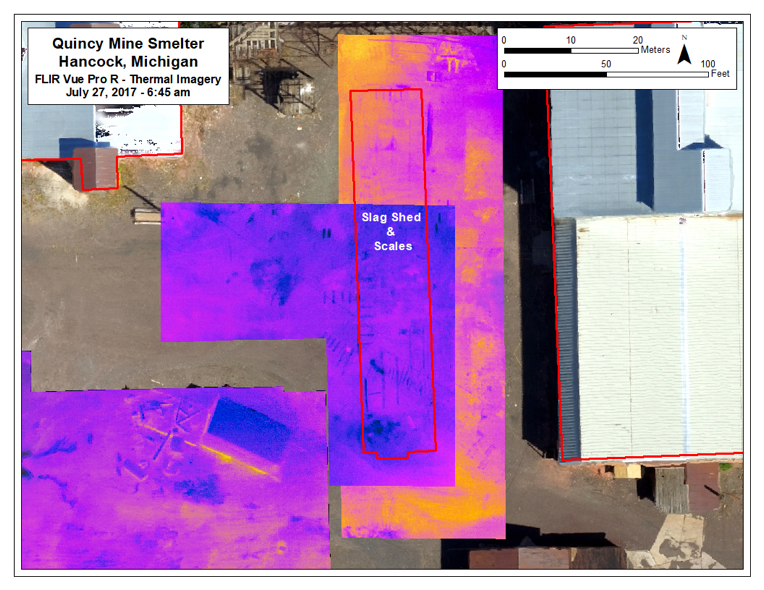 Differential thermal patterns reveal indications of some sub-surface structures at the location of the Slag Shed and Scales building. After reviewing and mosaicking the thermal imagery, cooler sub-surface features appeared where the Slag Shed and Scales building once existed in 1906. Lots of features! Some of these features, like the lumber scrap around the standing shed, are on the surface of the ground and are visible in the optical imagery. But most of the patterned strips that look like railroad ties are invisible and nobody had any idea they were there (Figure 6 and 7). At first glance, David thought these features were ties for rail tracks, but because they are geo-referenced and imported into ArcMap, he could measure them. The smaller features measure nearly seven feet, much larger than today’s standard 4.5-foot tie for modern gauge track (details in Figure 7). They may be cross ties for rail track, since larger size ties were used. Another possibility is that these features are some sort of foundational support for the Slag Shed and Scales building. Figure 7. Detail of geo-referenced FLIR Thermal Image photomosaic superimposed on the DEM in the area of the Slag Shed and Scales Building. We will have to do some "ground truthing" to find out what the different types of anomalies actually are under the ground! I will ask my students in Fall 2019 if they'd like to volunteer to help with some of the testing to assess the thermal anomalies. Right now, we've shared our findings with other archaeologists that have done work at the site over the years to get their thoughts. Hopefully we will be able to find funds to continue the study. We'd like to do another round of thermal imaging during the evening "cool down" as the ground emits all the energy it has absorbed during the day. I'd also like to add data captured using multi- and/or hyper-spectral instruments, since the different energy spectra all can reveal different potential about the site. My colleague Jeremy Shannon and his students ran some Ground Penetrating Radar at the site, and we'd like to pull his data into the GIS. If we can get some additional equipment for Tech's GPR, we'd also be able to more efficiently scan the entire work yard space at the smelter. The GPR has potential to add information about more deeply buried features, such as pipes and the boundary between the poor rock fill and the original shoreline and lake bottom. I am grateful to Rick and David and my colleagues at MTRI for their willingness to collaborate. Remote sensing and digitization tools are becoming much more readily available to archaeologists after a long period where only elite research institutions had common access to these technologies. I know that Rick and David are terribly busy with other research projects and I really value their efforts to help me spark some collaborative work. We are also using this material to create educational materials we can use in classrooms at Michigan Tech where students can use our tools to look at local sites and solve real world problems for local organizations. These are interesting and important technologies for industrial heritage and emerging professionals in the field must know how to use them, as operators and/or collaborators! Michigan Technological University's Industrial Archaeology students have helped the preservation efforts in many ways over the years, by volunteering time as archaeologists conducting forensic rescue excavation and recovery after an arson in 2010, assisting with cultural resources monitoring during ongoing environmental remediations, and advocating as volunteers within the community as part of the Quincy Smelter Association. Exemplary of that work, check out this blog that Sean Gohman and Craig Wilson put together as part of that effort! They included lots of photographs, maps, and historical discussion about the smelter. That blog is now an archived resource. The Copper Country Explorer is an independent website by Mark Forgrave has published lots of pics and information about the Quincy Smelter. The Quincy Smelter is typical of legacy sites in industrial heritage because it included a landscape with a legacy of environmental contamination that posed both ecological and public health hazards. Rather than acting hastily to demolish the site, many different partners worked for years to find ways to secure the site, remediate the toxic materials that posed threats to health or ecological systems, and start the bring the site back. The Environmental Protection Agency just published a short summary of the story of the smelter, Quincy Smelter: From Stamp Sands to National Historic Park. Michigan Tech students and faculty have supported the efforts to make wise decisions through the remediation process. As two examples, Fred Sutherland and Sean Gohman have both monitored remediation and clean up projects in past years. These legacies make the smelter an ideal laboratory for us where we can test the applications of various remote sensing technologies and work through the data fusion challenges, while also contributing to a long term preservation and interpretation effort. Can we use remote sensing technologies to map underground features? That would be much less expensive than having an archaeology crew do subsurface testing of the entire smelter complex to find those features. Once identified, the managers can plan to avoid important features during redevelopment. Can remote sensing help identify targets of that have high risk of toxic contaminants? Doing so will also help with planning. Understanding the subsurface "landscape" of historical features is essential to thoughtful and wise planning as the KNHP Advisory Commission and it's partners work to preserve the site and bring it back to life. We started last July by flying two instrument platforms: a DJI Phantom Quadcopter fitted with a 14 Megapixel Color Camera and a Bergen Hexacopter with an onboard FLIR Vue Pro R (radiometric) thermal sensor. Before the field days, I had gathered high-resolution scans of historic maps and blueprints of the Quincy Smelter site from the Michigan Tech's archive and the collections at the Keweenaw National Historical Park (some of those maps are also here). David set up a Geographic Information System database using all the historic plan maps that I could find. He traced the building footprints so that we could superimpose those plots overtop of any geo-referenced image of the site (Figures 2 and 3). Archaeologists have long used aerial thermal imaging to spot features and sites underground. The technique works because different materials, such as a stone foundation or a capped and buried well shaft, will absorb and radiate heat energy differently and patterns in this "differential thermal loading" therefore can reveal clues about what is buried under the ground. The Bergen Hexacopter UAV platform carried an onboard FLIR Vue Pro R (radiometric) thermal sensor for several flights during the early morning (Figures 4 and 5). We'd received FAA approval for a flight plan in the narrow window of time between civil twilight (when it becomes light enough to see) and actual sunrise. After the sun breaks over the horizon, the thermal energy of direct radiation overwhelms and "washes out" any subtle thermal variation in the ground surface. The drone captured most of our best images during a flight at about 6:45 AM. When researchers use thermal imaging in archaeological survey, it is common for them to also capture a series of images as the landscape cools down, flying between sunset and evening twilight. We didn't have FAA permission to conduct those flights, so we took only "warm up" images as the site began differentially absorbing the ambient energy from morning twilight, before the sun rose over the buildings. Like a GPS-equipped camera, the sensor captures images that are stored in JPEG format and can be used in GIS software such as ArcMAP and image mosaicking software such as Microsoft Image Composite Editor (ICE). The FLIR sensor records the radiated thermal energy as it varies from spot to spot on a surface, then assigns a false-color pixel to each value. This sensor has an imaging resolution of 640 x 512 and can sense temperatures between -4°F and 122°F. David used ICE to mosaic the individual images and then import that mosaic into the GIS. The results of his work were pretty remarkable! (See Figure 6 below). In my next post, I'm going to talk more about Rick's photogrammetry work. He has produced a remarkable Digital Elevation Model (DEM) of the site with tremendous potential to contribute to site management, study, and interpretation. 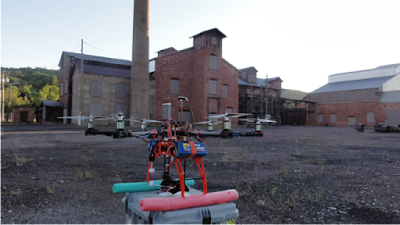 He is also designing experiments now to compare the applications of LiDAR and optical photogrammetry in industrial heritage. Or by contacting Benjamin Larson at the Michigan Tech Fund at 906-487-2464 or balarson@mtu.edu. Donated funds provide for student scholarships and equipment purchase and maintenance in the Industrial Heritage and Archaeology program. Hello blogosphere... it's been a while! I'll see how these look and keep you posted.